Just like in the car world, motorcycles and scooters are grouped by the insurance companies to help them calculate your insurance premium. A bike’s group will have a pivotal effect on the premium you are quoted. In fact its group will affect whether or not you can be offered a quote at all. There are between 17 and 22 groups that motorcycles are classified into, far fewer than the 50 groups that cars can be classified in and that’s mainly because, even though motorcycles vary dramatically in terms of their power outputs, their values are relatively close together. At the lower end, you might have a 125cc scooter with a value of £3,000 and an insurance group 3 and at the other end, a £70,000 Ducati Panigale 1299S Superleggera. A sixty-thousand pound difference, or 23 times as expensive. However in the car world, you might have a Dacia Sandero at £6,000 in group 5 and a £1.4m Bugatti Veyron Grand Sport Vitesse coming in at the slightly harder to insure end of the scale. A £1.394m difference or 233 times as expensive. Think of the group as a fixed unit but the rider and where the bike is kept are the variables. We all know that insurance companies have quote forms that are almost unending in their thirst for knowledge. Most of them appear pointless: Are you married? Do you own your own home? Do you like dogs or cats? How many years No Claims Bonus have you got? After those, everything else you enter will affect the quote but not by much. The age of the bike, it’s value, the points on your licence; we spoke to one insurance expert who said the factors in the list above will determine 80% of your quote, the other 20+ questions have a mere 20% influence. What are the cheapest motorbikes to insure? Generally speaking, the lower the bike’s cc and the lower its book price, the lower the quote will be. The majority of 125ss motorcycles, from scooters to commuters, sportsbikes to cruisers, the grouping will be around 3 to 7. However, these motorcycles are often ridden by inexperienced riders who tend to crash more frequently than experienced riders and so even though they have a low group, if you fit the criteria of the sort of rider who spend half of their weekend picking gravel out of their knees, then you might find them expensive to insure. Similarly, even though the performance of a ‘125cc sportsbike’ like Yamaha’s YZF-R125 is hardly any different to a CBF125 commuter, the Yamaha is more desirable and likely to get stolen more often. Also, if the two bikes are crashes, the YZF-R125 will probably cost more to repair, thanks to those sleek looking body panels. If you’re 40+, with over 10 years NCB, live in the sticks and opt for a CBF125, you’ll be such a low risk, the chances are the insurance companies will pay you. What are the most expensive motorcycles to insure? Sportsbikes tend to be the most expensive motorbikes to insure. In the Venn diagram of insurance quotes, they sit slap bang in the centre of the overlapping circles. Price, they tend to be more expensive to buy and parts more expensive to replace. Performance, they’re designed to be powerful and fast. Desirability, thieving scumbags love ‘em. 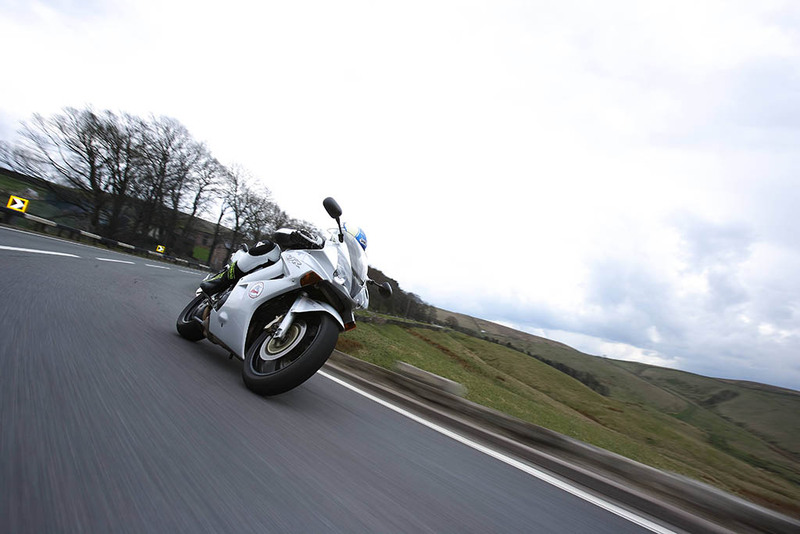 The majority of sportsbikes sit in the insurance bracket 15 and higher on the 17 group scale. Big ticket bikes like Ducati’s 1299 Superleggera and Desmosedici push the limits of group 17 insurance, so much so that some riders who can get quoted on more mainstream group 17 bikes, like Suzuki’s GSX-R1000 won’t be able to find a quote for the big Ducatis. Even using insurance comparison websites. You can’t do much about your age, where you live or how many years NCD you have. However there are a few factors you can easily control, in order to get a quote in the first place and also to reduce the cost of your insurance premiums. If you are struggling to get quotes, consider renting a garage. 75% of motorcycles are stolen on the street and the majority of these from urban areas. If you can store your motorbike in a garage you’re on your way to a cheaper insurance quote. Immobilisers, trackers, security markings like Datatag and strong locks that come with Thatcham, Sold Secure or RiDE ratings will help reduce your motorbike insurance quote. Often insurers ask for a ground anchor to be fitted in your garage and an alarm as standard. A few hundred quid spent on these can help you get the best quote. If you only ride 3,000 miles a year and only ever commute on the occasional sunny summer day, then consider whether you need a 6,000 mile policy (just in case you manage to get out of the house more this year) and whether you need Commuting on your policy of just Social, Domestic and Pleasure. The less you’re on the road and the less accident prone roads and times you ride on and in, the less risk the insurer will envisage and the lower your quote will be. In the nicest possible way, of course. A pillion increases your chances of having a crash and increases the amount of money an insurer may have to pay out, so don’t opt for pillion cover if you really don’t think you need it. The bike’s value has a lot to do with the price of your quote. Older, unmodified bikes will be far cheaper to insurance than the latest equivalent. So even though you can afford the monthly repayments on a brand new £16,000 Honda Fireblade, you’ll be much more likely to get a quote that won’t cause you chest pains if you opt for a 2010 Fireblade, worth £5k and, let’s be honest, just about as handy in the real world.